Dui Hua Executive Director John Kamm visited Hong Kong and Beijing September 16 – October 2. He had far-ranging talks on US-China relations and on human rights in China. Kamm’s trip to China coincided with a marked downturn in US-China relations. The trade war ramped up as both countries announced tariffs on two-way trade worth more than $300 billion. American sanctions were placed on a senior Chinese defense official accused of purchasing Russian military equipment, leading China to call off a military exchange and cancel a port visit by a US vessel to Hong Kong. Prior to and during the trip China was accused of trying to influence American elections and of shipping vast quantities of opioids to China. Especially troubling were confrontations between the countries over the disputed South China Sea. An American B52 was flown over Chinese man-made islands and on September 30 there was a near-collision involving Chinese and American vessels. A session of the US-China Diplomatic and Security Dialogue scheduled for October 15 was called off when Defense Secretary James Mattis was told that China’s Defense Secretary would not be available to meet him. In Hong Kong, Kamm met with the American Consul General Kurt Tong. He also met with Chinese officials, leaders of NGOs, scholars, business leaders, and journalists. Discussions centerd on the upcoming trials of Occupy Central activists, and the impact of the US-China trade war on Hong Kong. He discussed the international symposium on girls in conflict with the law to be held at Hong Kong University School of Law in April 2020. This program will bring together leading experts and practitioners to examine best practices to address issues related to this vulnerable but rarely talked about population. In Beijing, Kamm discussed cooperation on juvenile justice with the Supreme People’s Court (SPC). Dui Hua has thus far held five expert exchanges with the court’s Office of Juvenile Courts. Both sides agreed that the next exchange should take place in the United States. Topics of interest to the Chinese side were identified. The court’s Research Department gave an in-depth briefing on the different criteria used to determine which judgments are posted on the court’s judgment websites. Dui Hua believes that the number of cases being posted online has been dropping as court’s pay greater attention to making sure no judgments in cases involving state secrets are made publicly available. Kamm’s discussions with the SPC on judicial transparency were meant as a follow up to the foundation’s submission to China’s upcoming Universal Periodic Review (UPR) of its human rights record to be held in Geneva on November 6, 2018. Kamm and two colleagues will attend the UPR. Dui Hua’s executive director held a working dinner with Chinese officials in charge of human rights. The principal topic was preparations for the UPR. Meetings were also held with Chinese scholars and judicial officials. Kamm exchanged views with a senior official of an international humanitarian organization. As in past visits to Beijing, Kamm reached out to ambassadors of countries concerned with human rights in China that support Dui Hua’s work. He met with the ambassadors or deputy chiefs of mission from the United States, the European Union, Denmark, The Netherlands, Norway, Switzerland, and Sweden. A working lunch with diplomats from so-called “like-minded” countries was held, continuing a tradition dating back more than 20 years. Meetings with Chinese officials and foreign diplomats were dominated by the issue of Xinjiang. In the run-up to Kamm’s trip, numerous reports appeared in foreign media alleging the widespread internment and mistreatment of Uyghurs in “political education camps” – called “vocational training centers” by Chinese officials. Some reports asserted that as many as one million Uyghurs and members of other Muslim minority groups were being held in these facilities. The mass internment of Muslims as well as other measures to deal with perceived extremist or terrorist tendencies are certain to be major issues confronting China at its UPR. Dui Hua will report on the UPR in the next issue of Digest. Kou Ji (寇稽), sentenced to 10 years’ imprisonment and three years’ deprivation of political rights for subversion in 2013 by a Shaanxi court, received his second sentence reduction of seven months in May, according to an online judgment Dui Hua recently uncovered. Kou was given his first sentence reduction of nine months in 2016. He is now due to be released in July 2020. Dui Hua first discovered his name from a Shaanxi court work report in 2013. The specifics of his case remain largely unknown. Dui Hua has received no government responses about him despite repeated inquiries since 2015. Lee Ming-che (left) stood trial together with Peng Yuhua (right). The hearing was broadcast live on the Sina Weibo account of the Yueyang Intermediate People’s Court. In September, a government response provided to Dui Hua confirmed that Peng Yuhua (彭宇华) is now serving his seven years’ imprisonment sentence for subversion in Hunan’s Chishan Prison. The response stated that Peng is in good condition and that his behavior is very good. Peng has not applied for a sentence reduction; he was detained 18 months ago and may not be eligible for a reduction yet. Peng was a co-defendant with Lee Ming-che (李明哲); both were sentenced in the same trial by the Yueyang Intermediate People’s Court on November 28, 2017. 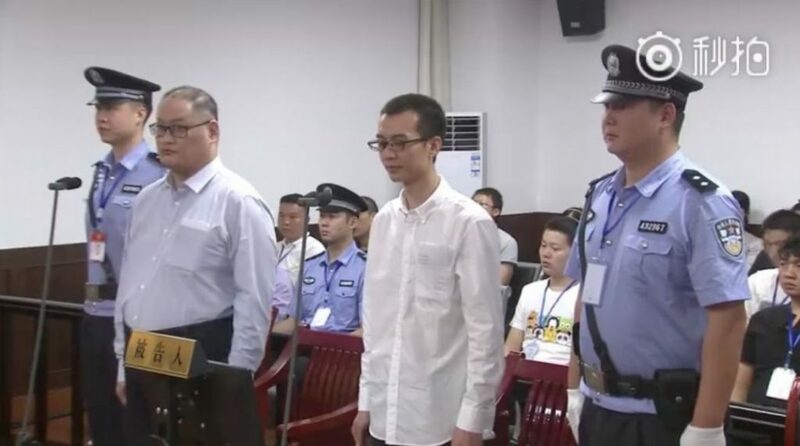 The court claimed that Peng was the ringleader and Lee was an active participant in setting up a number of online groups to attack the Chinese socialist system and advocate for a western political model. The indictment indicated that the duo intended to recruit a million members in 2017 to overthrow the Chinese government. Despite having received a two-year lengthier sentence for the same charge, Peng did not receive the same extent of media coverage as Lee. Many democracy activists in China have questioned Peng’s identity as they had not heard of his name prior to the hearing. Hsiao Yi-ming, Executive Secretary of the Taipei-based Judicial Reform Foundation, speculated that Peng was being used by authorities to strengthen the allegations against Lee. Hsiao stated that none of Lee’s friends in China were aware of any connection between Lee and Peng. 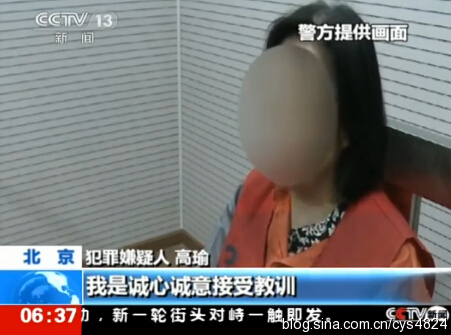 In China, transparency on endangering state security (ESS) cases is low in many respects. China Law Yearbook, an official judicial compendium that publishes judicial statistics, states that 4,818 individuals were indicted for ESS crimes during the four-year period from 2011-2014. In recent years, China Law Yearbook has obscured this information by counting ESS cases under the category of “others.” Dui Hua estimates that more than 1,000 individuals have been indicted every year for ESS crimes since 2015. A group of mourners assemble for the walk to Zhou Enlai’s funeral in a side hall of the Forbidden City. All photos by author. On January 8, I was advised that my request for an interview had been granted. I was told to come to a room on the top floor of the Shanghai Mansions at 10 PM, an unusually late hour for meetings in China. 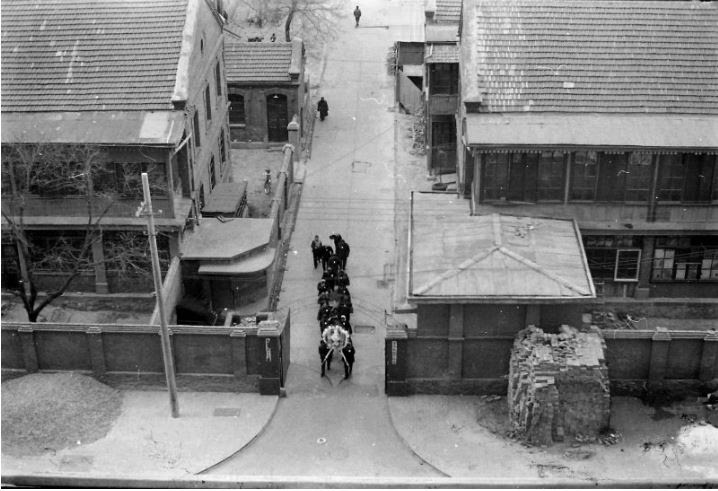 I spent some time putting together my questions, and then prepared to join a tour of a Shanghai commune. When I tried to sign up for the tour however I was told that I was not welcome to join. I protested to the liaison office to no avail. I headed out on another walk, this time witnessing the arrest of a Shanghai citizen by a police officer. The officer frog marched the young man down a narrow alley, attracting a throng of curious onlookers. I went back to the Shanghai Mansions, had dinner, and waited in my room for the interview. At the appointed hour I went to the assigned room and found about two dozen cadres led by “leading Member” Chen Wenhai waiting for me. The interview was a formal affair, no smiles or words of greeting. I was told the ground rules. I would first ask all my questions. Thereafter I would be given a brief introduction to the trade fair. No further questions would be entertained. I must have asked thirty or so questions, after which I was given the brief introduction. It quickly became apparent that few of my questions would be answered. The “brief introduction” started out with words of praise for the wise leader Chairman Mao Zedong and the correct policies of the Chinese Communist Party. I was then given the bare bones facts of the trade fair: how large the exhibition space was, how many provincial animal by-products branches were in attendance, how many traders from which foreign countries were in attendance. That was it. I tried to slip in one more question. In 1975 China agreed for the first time to sew into garments intended for export the labels of the western company that had ordered them according to their specifications. This was a welcome reform as Chinese labels like Peony, Snowflake, and the like didn’t appeal much to American and European consumers. Suddenly, at this minifair, traders had been advised that this policy had been cancelled. No more foreign labels would be sewn into Chinese made garments. There was much unhappiness among foreign traders about this sudden change, and I wanted to ask a question about why this step had been taken. I never got a chance to do so. I was cut off and reminded that there would be no more questions and told that the interview was over. Shortly after returning to my room the phone, an old black apparatus with a solid feel, started ringing. It was the young sailor I had befriended the night before. His voice was shaking, and I guessed he had company sitting nearby. Obviously distressed, he told me that he was leaving Shanghai early, and that I was not to try to contact him. He told me he would always remember our friendship. He rang off. A cold shiver ran up my spine. I went to bed, but had trouble falling asleep. In the early hours of January 9, I heard a great commotion taking place on the barges on Suzhou Creek below me. There were loud voices and the sounds of fighting. I dozed off and when I awoke I saw the streets lined with military vehicles, and all the barges gone. In the distance I could hear the somber music of a funeral dirge. I left my room and encountered an elderly floor attendant. What has happened I asked? He told me that Premier Zhou Enlai had died. He was weeping. I and other trade fair attendees went to the liaison office to find out more. The official who met us solemnly announced the premier’s passing, and then told us that “the Chinese people will turn grief into strength” and that they would carry on the great traditions of the revolutionary leader. There would be no interruption to the trade fair. Business as usual. To reinforce this point, the liaison office laid on visits for the attendees and this time I was invited to join the tours. We were offered visits to a well-off commune on the outskirts of the city – one of its production brigades specialized in raising “hairy crabs,” a Shanghai delicacy – and a factory making feather and down garments. Our visits were punctuated by bursts of propaganda praising the Great Proletarian Cultural Revolution. Upon my return to the hotel I ran into the Australian who I had met on the train up to Guangzhou and his wife. They had just had a harrowing experience. They had gone for a morning walk and saw crowds of people reading newspapers which had been posted on wooden hoardings. They were reading official news of Zhou Enlai’s death, and the couple decided to photograph the scene. Bad move. In those days it was against the law for foreigners to purchase or even read local newspapers like the Wen Wei Bao and Liberation Daily. The couple were swiftly taken into custody by the local neighborhood committee and held in a small room until the police showed up. They were interrogated and lectured at length. Their actions were unlawful and violated the terms of their visit to China. After signing expressions of regret, and apologizing profusely, the couple were escorted back to the Shanghai Mansions. The next day I flew to Beijing where I attended the fur garments minifair, and visited one of the model communes on the city’s outskirts as well as, of course, the Great Wall and the Ming Tombs. On January 12, I took part in the funeral of Zhou Enlai as a member of the American delegation. Diplomats were all dressed in black, thin clothing for the bitter cold. We were received on the dais by Jiang Qing, wife of Chairman Mao Zedong, one of the members of the Shanghai Faction later to be known as the Gang of Four. Zhang Chunqiao was also present. China would be visited with much more sorrow in 1976: the campaign against the right deviationist wind, the Ching Ming protests and the deadly response, the July earthquake in Tangshan, and much joy when the Gang of Four was overthrown in October. I witnessed all of those events during many visits to the country that year. Upon my return to Hong Kong after attending Zhou’s funeral I was asked by a friend at Ta Kung Pao, a left-wing newspaper, to write a eulogy for the recently departed premier. I did so, and the piece ran under the Chinese name given to me by a teacher in the United States: Kang Youhan (康又瀚). The eulogy was full of praise for Zhou. A few days after it appeared my friend told me that the article had been removed from the Reference News edition published in Shanghai. My friend suggested that I adopt a new name for any future Chinese language articles I might write. I adopted the name Kang Yuan (康原), and have kept it to the present day. Postscript: More than 30 years later, I took a small group of businesspeople to Shanghai. We went to the restaurant at the top of the Peace Hotel, and there I recounted the story of the defiant young waiter. Across the room I spied a man of roughly my age who was now the manager of the restaurant. He looked familiar, and I asked him to come to our table. He complied, and we quickly figured out that he was that young waiter I had encountered in January 1976. In excited voices we relived what had happened. Misty eyed, he asked me a favor. Would I be willing to come back and talk to his young charges? “Young people have no idea how we lived then. And they aren’t interested. You can help. Please come back.” I agreed to do so, but when I returned a few months later the restaurant was closed for renovation. I subsequently found out that Mr. Zhang the manager had retired.